This aim of this paper is to describe the trends in the burden of severe lactational mastitis among women in Ireland through an analysis of postnatal mastitis hospital admission rates from 2006 to 2015. Data on all postnatal hospitalisations with principal diagnosis of mastitis were extracted from the Hospital Inpatient Enquiry system. Trends in annual admission rates per 10,000 live births were analysed using non-parametric trend tests. The overall admission rate for lactational mastitis was 24.4/10,000 live births. There was a significant increase in admission rates from 22.7/10,000 in 2006, to 30.9/10,000 in 2015 (Mann Kendall Trend: t=0.64; Sen’s slope=1.46, p=0.01). Ireland has a high hospital admission rate for lactational mastitis, despite very low breastfeeding rates. These two factors may be linked, with low breastfeeding prevalence possibly contributing to low levels of expertise in the management of mastitis, leading to higher complication rates. This is an important area for future research. The aim of this paper is to assess the burden of severe lactational mastitis among women in Ireland. We present an analysis of the annual hospital admission rates for mastitis associated with the puerperium and lactation over a ten year period from 2006 to 2015. As breastfeeding rates continue to increase in Ireland, information on the burden of lactational mastitis is useful so as to help inform service planning for the expected increasing number of mother infant breastfeeding dyads over future years. The clinical presentation of mastitis varies along a continuum from the milder end of non-infective engorgement right through to infective mastitis with breast abscess formation. When bacterial infection is present, a tender, hot, swollen, wedge-shaped area of redness develops on the affected breast and is associated with an elevated temperature and systemic symptoms. The majority of infective mastitis cases can be effectively managed in primary care and specific guidance on management is available.5, 6 Treatment with an appropriate antibiotic7 is recommended for cases in which symptoms persist beyond 24 hours. Treatment in hospital is required for severe cases. It has been widely reported that hospital admission rates for mastitis are low, but published information on population-based studies are limited. One US hospital-based study reported a post-natal mastitis admission rate of 9.3 per 10,000 deliveries with an incidence of mastitis with breast abscess of 2.6 per 10,000 deliveries. 8 Information on the incidence of breast abscess in postnatal women is limited but has been reported to occur in 11% to 3% of mastitis cases. 9 Historically treatment for breast abscesses was by surgical incision and open drainage10 but with advances in imaging, an increasing proportion of cases can be managed by needle aspiration under local anaesthetic with ultrasound visualisation.11, 12, 13 Although needle aspiration is the preferred procedure, there remains a role for surgical incision and drainage especially for large and multiple abscesses. Data were extracted on post natal women with a principal diagnosis of mastitis associated with the puerperium or lactation who were admitted to hospitals in Ireland for the period 1/1/2006 to 31/12/2015. Variables included age of patient, in-patient or day case care, duration of hospital stay, procedures and General Medical Service (GMS) medical card status (card is means based and entitles holders to free healthcare). The 8th Edition of ICD10-AM/ACHI/ACS was used and the ICD-10 codes under O91 were used for infections of the breast (abscess of the breast and non-purulent mastitis) associated with the puerperium and lactation. The procedure codes were 9072500 for needle aspiration and 3155100 for incision and drainage. Admission rates per 10,000 live births were calculated using national birth data from the annual National Perinatal Reporting System (NPRS) which collates information on approximately 70,000 birth records each year from all maternity units including the two private maternity units, as well as information on home births from all practicing self employed community midwives.18 NPRS also provides information on type of infant feeding at time of hospital discharge. The proportions reporting either exclusive breastfeeding or combined breastfeeding and artificial feeding are reported here as mastitis can occur in any lactating woman irrespective of whether or not the infant is being fed exclusively with breastmilk, or otherwise. To identify significant changes in trend the non-parametric Mann Kendall trend test was used, and Sen’s slope estimator was used to estimate the true slope. Chi square tests were performed to identify differences in proportions between groups. Statistical significance was set at p<0.05. Analysis was undertaken in Microsoft Excel and R version 3.5.0. In Ireland the breastfeeding rates at time of discharge from hospital have been steadily increasing over the period from 2006 to 2015 (Fig 1). During this period there were 710,903 live births in Ireland and there were 1,738 admissions to public hospitals of postnatal women with a principal diagnosis of mastitis. The overall hospitalisation rate for lactational mastitis was 24.4/10,000 live births for the 2006 to 2015 period. The total number of hospital bed days was 5,287 days. Most admissions (91.7%) were to the hospitals with maternity units and 8.3% (n=144) were admitted to acute general hospitals that did not have a maternity unit, but did have a specialised breast care service. The overall proportion of hospitalised lactational mastitis cases with a GMS medical card was 15% (n=253). Among all admissions with a principal diagnosis of mastitis, 97% (n=1,686) were in-patients and 3% (n=52) were admitted as day cases. The median age of mothers was 32 years (range 16-47 years) and the median length of stay for in-patients was 3 days (range 1-18 days). 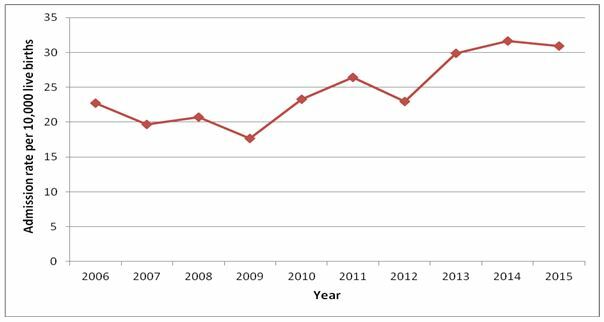 Fig 1 Percentage of mothers of live births that were breastfeeding (both exclusively and non-exclusively) at time of hospital discharge by year from 2006 to 2015 in Ireland. The annual hospitalisation rates for each year for women with a principal diagnosis of mastitis are presented in Figure 2. There was a significant increasing trend in the annual admission rate per 10,000 live births from 2006 to 2015, with an admission rate of 22.7 per 10,000 live births in 2006 increasing to 30.9 per 10,000 live births in 2015 (Mann Kendall Trend: t=0.64; Sen’s slope=1.46, p=0.01). 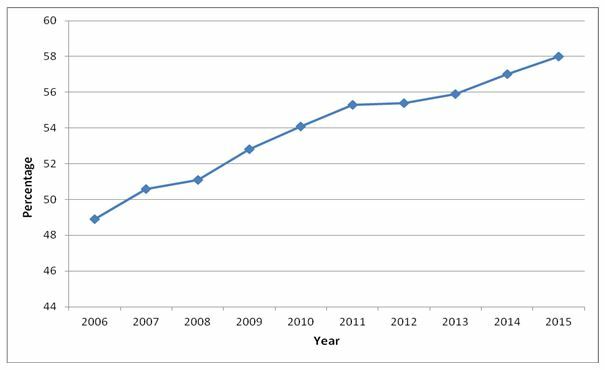 Fig 2 Annual admission rate of women with a principal diagnosis of mastitis per 10,000 live births by year from 2006 to 2015 in Ireland. Over the 10 year period, 14.7% (n= 255) of admissions for lactational mastitis involved a procedure in the treatment of a breast abscess. Of these, 58% (n=147) involved surgical incision and drainage and 42% (n=108) of cases were treated with needle aspiration. While the admission rate for lactational mastitis per 10,000 live births had increased over the period 2006 to 2015, the proportion of the cases undergoing an invasive procedure in their treatment decreased significantly over this time (t=0.60, Sen’s slope=-0.78, p=0.02). By type of procedure (incision and drainage versus needle aspiration), the proportion of all mastitis admissions undergoing an incision and drainage procedure decreased significantly in this period (t=-0.64, Sen’s slope = -0.016, p=0.01) however there was no significant trend seen in the proportion of needle aspirations that were performed (p=0.21) (Table 1). Ireland has one of the lowest breastfeeding rates in the world and yet this study has found that the national annual hospital admission rates for lactational mastitis are high. For example, in 2015, only 35% of infants at three months of age were being breastfed (both exclusively and not exclusively) and during that year, the admission rate for lactational mastitis was 30.9 per 10, 000 live births, a rate over three times the hospitalisation rate reported from a study in the US.8 This study shows that the burden of severe mastitis is significant in Ireland and involved use of over 5,250 hospital bed days during the ten year period studied. Of concern is a statistically significant increase in annual hospitalisation rates over time, a finding which is in line with the year on year increase in breastfeeding rates over the same period. These findings are likely to reflect a true increase in the burden of severe mastitis in Ireland as during this time there had been no shift in practice or incentives regarding the provision of hospital care for severe cases. It is known that early, effective and appropriate management of mastitis can greatly reduce the risks of complications arising which necessitate hospital care.6 At present there is limited information on the epidemiology of lactational mastitis in Ireland or on current clinical practice regarding its management. The finding of a high admission rate for mastitis, despite there being a very low breastfeeding rate, points to the possibility that there may be low levels of experience and knowledge on the correct management of early mastitis both among clinicians and among those affected. This report has also shown that while the needle aspiration rates for breast abscess are relatively stable, there has been a statistically significant decline over time in the proportions of cases undergoing surgical incision and drainage. This trend may be due to improvements in the early identification and treatment of breast abscesses and the decline in invasive procedures is in line with international trends.11, 12, 13 Of note also is the finding that 1 in 12 of all admissions for lactational mastitis were to hospitals that do not have a maternity unit. It would be important to ensure that cases in non-maternity unit hospitals have ready access to specialist breastfeeding support and advice in order to facilitate continued breastfeeding, as appropriate. A review of case management in these services would be helpful in informing appropriate clinical guidelines and care pathways. A major strength of this work is that it is a population-based study that has provided an estimate of the burden of severe mastitis in Ireland using data from the national HIPE which is known process to be a robust system.19 A limitation of HIPE is that data is based on each episode of care and the absence of a unique patient identifier means that it is not possible to link events in different hospitals. For some mastitis cases, it is likely that either there were hospital re-admissions or transfers to other hospitals and therefore an overestimation of the burden of severe mastitis is possible. However, this may be have been offset by a separate possible limitation which is the non-availability of admission data from a small number of private hospitals in Ireland, which could lead to a possible underestimation of the burden of the disease. However, as all private maternity units have been included within HIPE, it is likely that there were very few mastitis cases managed in non-HIPE participating private hospitals during the period of this study. This study has identified important areas for further research on the epidemiology of lactational mastitis in Ireland which could be used to reduce the burden of morbidity associated with this condition. The population incidence rate of mastitis could be provided from a suitably designed cohort study among a representative sample of lactating women. Estimates of the proportion of cases requiring hospital admission could be obtained by using the incidence rate data along with the HIPE data, which is available at hospital level. Epidemiological studies of the lactational mastitis cases managed in the community and in hospitals would help identify the further key interventions for both prevention and improvement in the management of cases. Clinical audit of the mastitis cases receiving treatment in hospital would also be helpful in informing best clinical practice and this could include identification of possible opportunities to minimise the need for hospitalisation. This study has demonstrated a high hospital admission rate for lactational mastitis in Ireland. Effective early management of mastitis cases is important in order to minimise the risks of complications which require hospital admission, which can result in significant health, social and economic consequences. Therefore it is important that we achieve a better understanding of this condition and that the necessary lactation expertise and supports be in place to meet the growing needs in Ireland, which have arisen from the very welcome recent increase in breastfeeding rates. We would like to acknowledge the Healthcare Pricing Office (HPO) of the Health Service Executive who manage the Hospital Inpatient Enquiry (HIPE) system and the advice of Dr. Anne O’Farrell, biostatistician at the HSE Health Information Unit. 2. Amir LH, Trupin S, Kvist LJ. Diagnosis and treatment of mastitis in breastfeeding women. J Hum Lact 2014;30 (1):10-3. 3. Amir LH, Forster DA, Lumley J, McLachlan H. A descriptive study of mastitis in Australian breastfeeding women: incidence and determinants. BMC Public Health 2007;7:62. 4. Cullinane M, Amir LH, Donath SM, Garland SM, Tabrizi SN, Payne MS, Bennett CM. Determinants of mastitis in women in the CASTLE study: a cohort study. BMC Fam Pract 2015;16:181. 9. Amir LH, Forster D, McLachlan H, Lumley J. Incidence of breast abscess in lactating women: report from an Australian cohort. BJOG 2004;111(12):1378-81. 10. Amir LH. Managing common breastfeeding problems in the community. BMJ 2014;348:g2954. 11. Royal Women's Hospital. Mastitis and Breast Abscess Clinical Practice Guideline. 2013. Available at: http://www.thewomens.org.au/uploads/downloads/HealthProfessionals/PGP_PDFs/Mastitis_and_Breast_Abscess.pdf. 12. Naeem M, Rahimnajjad MK, Rahimnajjad NA, Ahmed QJ, Fazel PA, Owais M. Comparison of incision and drainage against needle aspiration for the treatment of breast abscess. Am Surg 2012;78(11):1224-7. 13. Lam E, Chan T, Wiseman SM. Breast abscess: evidence based management recommendations. Expert Rev Anti Infect Ther 2014;12(7):753-62. 14. Victora CG, Bahl R, Barros AJ, França GV, Horton S, Krasevec J, Murch S, Sankar MJ, Walker N, Lancet Breastfeeding Series Group. Breastfeeding in the 21st century: epidemiology, mechanisms, and lifelong effect. Lancet 2016;387(10017):475-90. 19. Wiley MM Using HIPE data as a research and planning tool: limitations and opportunities: a response. Ir J Med Sci 2005;174:52–6.